I've mentioned before that my father wasn't much of a cook, but there were a few things he liked to make and cheese fondue was one of the things he pulled off quite well. So I have lots of great memories of making and eating this dish, which is as much a fun experience as it is a tasty treat. My dad's fondue pot was one of the few things I think survived his '70s bachelor pad into our '80s suburban home. I don't know what happened to his set, but it was really cool: an electric fondue pot with an orange enamel finish. The nonstick finish on the inside was a bit worn, but not so bad that you'd toss it. Classic cheese fondue uses just the few ingredients you see here, plus bread and other things for dipping. My own foray into fondue began in the early 2000s, when my roommate, the Lady Lawyer, and I discovered our shared love for the dish. Given our tiny recently graduated salaries, we didn't have a fondue pot and we didn't forage for fancy imported cheese. We used a pre-mixed fondue kit from Safeway (which was surprisingly good and made with actual wine and cheese) melted in a cheap saucepan over the stove. As the fondue solidified, we re-melted it occasionally. And we loved it. A few years later, after Chris and I moved in together I got my first honest-to-goodness fondue set. It was quite the affair: a large disc base with indentations for setting ramekins of dipping sauce and a rack in the middle for suspending the fondue pot above a can of Sterno, a sort of flammable jellied alcohol. As much fun as we had with this set, it had some drawbacks. The pot wasn't nonstick, so the cheese had a tendency to stick and then cook on to the bottom of the pot, making it difficult to clean. I also found the heat harder to control: an adjustable vent rotated to make the flame larger or smaller, but I found it was too easy to accidentally put it out by closing the vent too much. 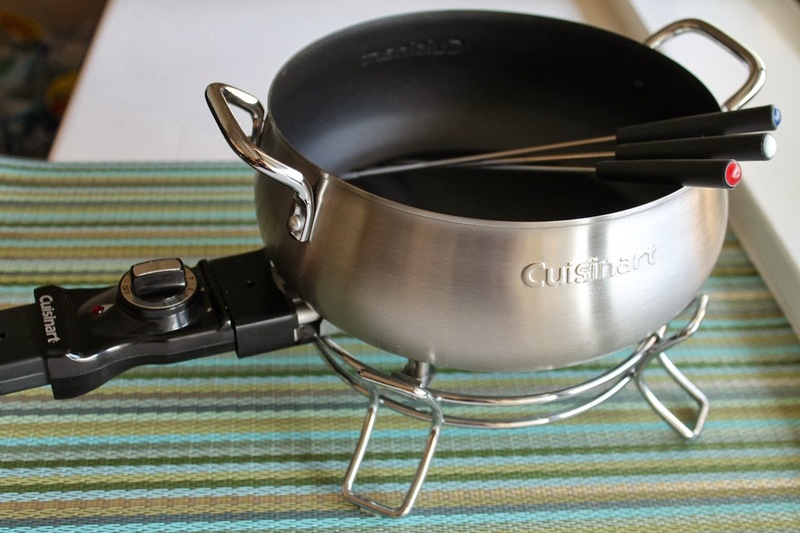 So I was glad to eventually upgrade to a Cuisinart nonstick electric model. In addition to having more control with the heat, an added bonus of an electric model is that you cook the fondue in this pot; no need to dirty another saucepan before transferring the mixture to a pot. Lacking that large disc base (which we didn't use anyway, since we never make meat fondue), it also takes up less space in my cupboard. I absolutely love it. The selection of cheeses is up to you. Although I don't know exactly, I imagine my father just used American Swiss cheese, which will certainly make for a fun fondue evening, but I prefer the better flavor of true Swiss cheeses, specifically a blend of gruyere and emmentaler. Since I really love the flavor of gruyere, I usually use more of that, although it's strong flavor isn't for everyone. I've tried other combinations, usually for thematic reasons, like cheddar and Monterey jack made with Mexican beer for a nacho-style fondue. A few tricks: rub a cut raw garlic clove all around the inside of the fondue pot before you begin cooking and, if desired, drop it into the pot. Use a dry white wine but not chardonnay, since it's pronounced flavor isn't right for fondue. I usually use sauvignon blanc, but chenin blanc or viognier would probably work well too. I imagine you could even use pinot grigio, but I've not tried it. When melting the cheese, just add a handful at a time. Don't try to melt it all at once or could end up getting stringy. While toasted bread cubes are an absolute must for serving fondue, I often add a few other things. Lightly steamed broccoli, small pickles and apple cubes work well. Depending on the type of fondue you're making, you might also like tortilla chips, carrot sticks, pita bread, etc. If you come up with something imaginative, please share. 1/2 baguette, crusts removed, bread cut into 1-inch cubes and lightly toasted in an oven (10 minutes at 350 F). 1. Combine the cornstarch with the shredded cheeses in a large bowl and toss to coat. 2. Rub the cut side of the garlic clove all along the bottom of the fondue pot and halfway up the sides. Drop the garlic into the pot. 3. Add the wine to the pot. Set the fondue pot heat setting to "cook" (setting 5 on my pot). 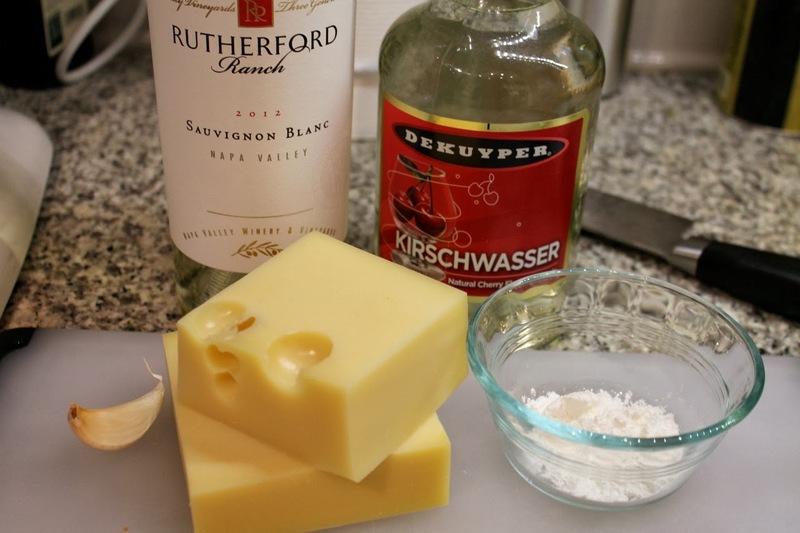 When the wine achieves a vigorous simmer, add a handful of cheese and stir with a wooden spoon or spatula until the cheese is completely melted. Continue adding cheese by the handful and stirring until completely melted before adding the next handful. Stir in the Kirschwasser. Set the fondue pot heat setting to "warm." Cheese should very gently simmer, but not boil (setting 3 on my pot, although I often turn it down to 2). 3. Heat a medium saucepan over medium. Add wine and bring to a vigorous simmer. 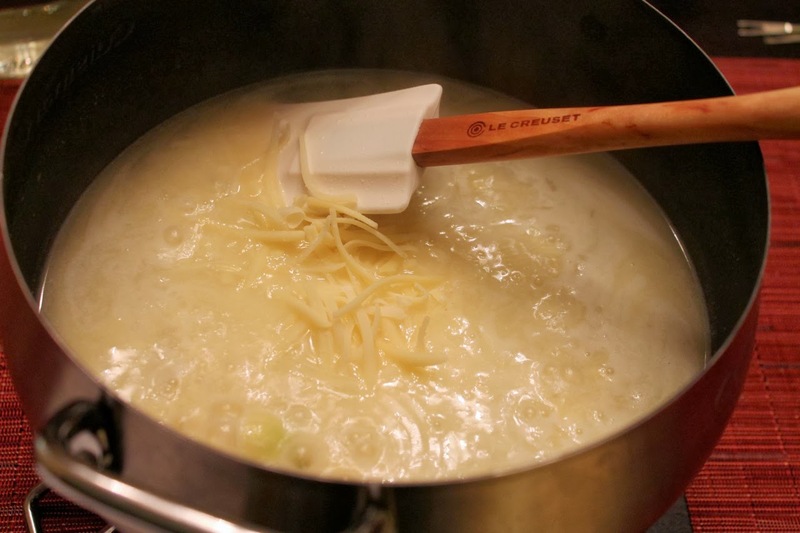 Add a handful of cheese and stir with a wooden spoon or spatula until the cheese is completely melted. Continue adding cheese by the handful and stirring until completely melted before adding the next handful. Stir in the Kirschwasser. Place the Sterno under the fondue pot and carefully light it (I suggest a long wooden match). 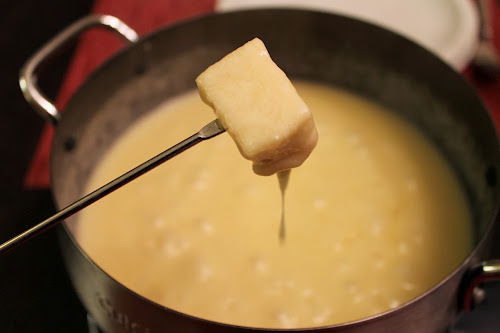 Transfer the cooked cheese sauce to the fondue pot. Adjust heat as necessary to keep it very gently simmering (it should not boil). 4. Serve fondue warm with bread, fruit and vegetables for dipping. I'm generally no fan of communal eating, but you've turned me on to fondue in a big way. Let's have another fondue night soon!